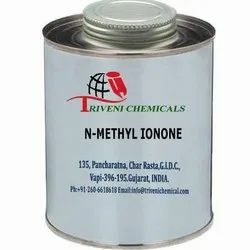 Manufacturer of a wide range of products which include n-methyl ionone. N-Methyl ionone (1335-46-2) is yellow clear liquid. it is also known as Methyl Ionone and Isoraldeine 70. It is use in perfumery, food flavours, Aromatic, cosmetic, Soap Detergent and Fraganance Industry. Storage: Keep container tightly closed. Keep container in a cool, well-ventilated area. Waste Disposal: Waste must be disposed of in accordance with federal, state and local environmental control regulations. Looking for Methylene Compounds ?